Benjamin Netanyahu has warned that “darkness is descending” as Iran expands its sphere of influence in the Middle East. Louvre show opens in Tehran as cultural diplomacy thrives Read more “The force behind so much that is bad is this radical tyranny in Tehran,” the Israeli prime minister told the American Israel Public Affairs Committee (Aipac) conference in Washington on Tuesday. “If I have a message for you today, it’s a very simple one: we must stop Iran, we will stop Iran.” Plagued by a corruption scandal at home, Netanyahu is clearly relishing the role of international statesman during a five-day US trip, putting on a united front with Donald Trump on Iran and the recognition of Jerusalem as Israel’s capital. 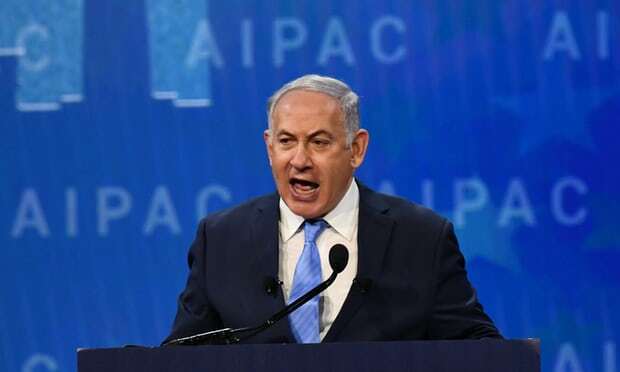 Netanyahu told Aipac he had warned against the Iran nuclear deal brokered by the Barack Obama administration and claimed vindication. Pointing to a map of the Middle East showing Iran’s alleged dominance, he said: “Darkness is descending on our region. Iran is building an aggressive empire: Iran, Iraq, Syria, Lebanon, Gaza, Yemen, more to come.” He said Tehran was seeking to build permanent military bases in Syria – where Iranian-backed forces support President Bashar al-Assad in a civil war – and develop factories there and in Lebanon for precision-guided missiles capable of striking Israel. “I will not let that happen,” he said. “We will not let that happen.” Netanyahu and Trump enjoy arguably the closest relationship of any two Israeli and US leaders. Both are also facing politically damaging domestic investigations embroiling their families. Both have dismissed the allegations as “fake news”. The Israeli prime minister – awaiting a decision by Israel’s attorney general on whether to indict him, as police have recommended in two bribery cases – lavished more praise his counterpart on Tuesday. “President Trump has made it clear that his administration will not accept Iran’s aggression in the region,” he said. “He has made clear that he too will never accept a nuclear-armed Iran. That is the right policy. “I salute President Trump on this and the president has also made it clear that if the fatal flaws of the nuclear deal are not fixed he will walk away from the deal and restore sanctions. “Israel will be right there by America’s side and let me tell you, so will other countries in the region.” Both leaders have long spoken out against the Iran nuclear deal, citing its limited duration and the fact it does not cover Iran’s ballistic missile programme or support for anti-Israel militants. Netanyahu also thanked Trump’s team, including the president’s son-in-law Jared Kushner, for their commitment to peace in the Middle East. Kushner’s role has been questioned after his security clearance was downgraded, denying him access to some top-level intelligence, amid revelations over possible conflicts of interest. Trump says 'I may' attend opening of US embassy in Jerusalem Read more The pro-Israel lobby group’s conference is an annual display of solidarity addressed by both Republicans and Democrats. Netanyahu basked in applause and paid tribute to a “beautiful alliance” and “eternal bond”. Mitch McConnell, the Republican Senate majority leader, also drew attention to Iran. “The Obama administration’s fealty to the nuclear deal spawned a reluctance to address Iran’s regional ambitions,” he said. “The notion that Sunni powers in the Middle East needed to learn to ‘share the neighborhood’ with Iran created a void. And Iran was happy to exploit that void, menacing our ships and planes deployed to the Persian Gulf.”.